When your truck is your office, you rely on a wide variety of equipment, accessories and electronics to get the job done. 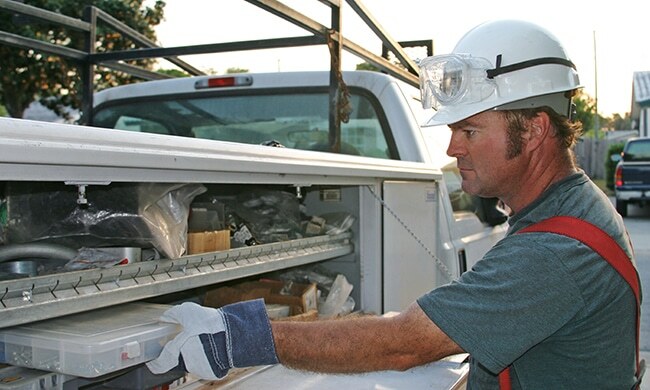 Among utility truck upfitters, Precision Installations has decades of experience installing storage equipment, lighting, and audio and visual packages on all types of vehicles. Whether you have a mid-size or full-size pickup truck or a heavy-duty utility truck, you can rely on us to install a wide range of products and equipment to meet your upfitting needs. Utility Truck lighting & warning lights for trucks. Your day-to-day job duties require custom vehicle lighting for a variety of situations. Whether you’re looking for interior truck lights, warning lights for trucks or want to custom-design a lighting package, Precision Installations has it covered. We have access to a variety of vehicle lighting options. Contact us at 920.380.1360. Need ladder racks or utility truck racking systems installed? Our installation technicians have years of experience creating the most efficient racking systems for our customers. At Precision Installations, we work with you to understand what is needed so you can get back to doing your best work. You need to rely on the strongest most durable equipment and products to get you through the work day. Not only do we carry high-quality products that handle wear and tear, but you can also rely on our extensively trained utility truck outfitters, who will get the job done right and on time. We’ll also add shelving, cabinets, ladder racks, accessories and lighting to your enclosed work trailer. There is no need to go to multiple work truck outfitters—we will be your one-stop shop for one utility truck or an entire fleet. At Precision Installations, we believe our job is to make it easier to do yours. Put your trust in our experience for outfitting new trucks or upgrading your current truck, no matter what industry you work in. Contact us or give us a call at 920.380.1360 for your next upfitting project. "Thank you for installing the utility work lights on all of our work trucks. Brings me peace of mind knowing we've added that safety feature to our fleet. "